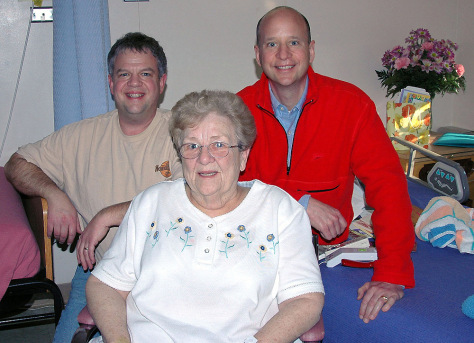 Ann Sterling is shown with her sons Donald, left, and Charles at Central Michigan Community Hospital in Mt. Pleasant, Mich., Feb. 4. Ann Sterling, 75, suffered a stroke this year in Michigan. Charles, who lives in California, keeps up with phone calls to his mother and e-mails to siblings, and took time off from work last month to fly to her bedside.